As so many Sutton South residents commute into London to work every day, and we value our direct connections to St. Pancras, the loss of our cross-London train services, if the Thameslink / Capital Connect services terminate at Blackfriars, will be a blow to local people. 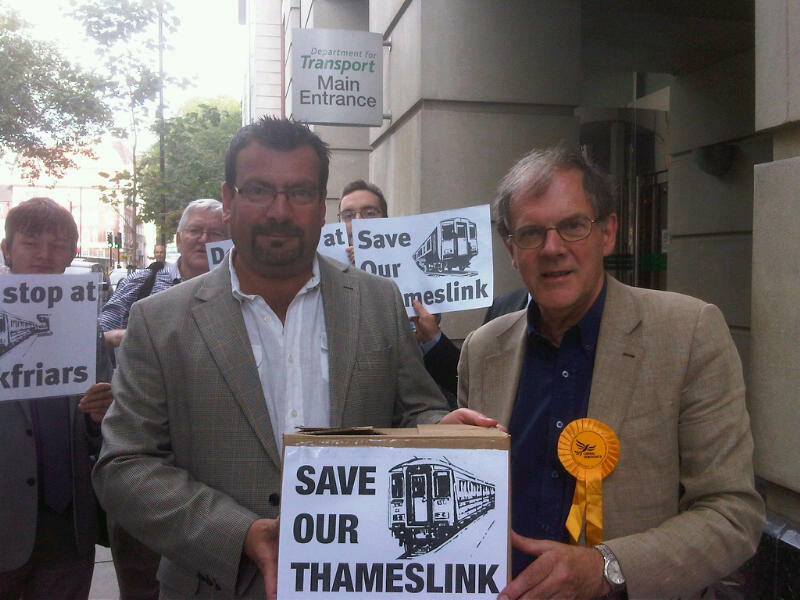 On 23 August Richard joined Councillor Simon Wales, together with Liberal Democrat activists from neighbouring Boroughs, to present our petition to the Department for Transport at their Head Office in Marsham Street, Westminster. The petiton called on the Department to put a stop to these proposals. Below is our own submission. 1. We are the elected Liberal Democrat Councillors for Sutton South Ward, which is just south of Sutton railway station. Passengers leaving Sutton station to the south, by the side entrance (when it is open), pass into Sutton South Ward as they leave the station. 2. Our Ward is almost entirely residential and a significant number of our residents commute daily into central London for work. Many of these commuters use trains on the Thameslink Loop Line to travel to stations north of Blackfriars, including Farringdon and St. Pancras. Residents of the Ward also tell us they consider they benefit greatly from having a direct service to St. Pancras International, for Continental Europe, and Luton airport. 3. For that reason we are concerned at the proposal, first set out in the London and South East Route Utilisation Strategy (July 2011), that all Sutton / Wimbledon Thameslink Loop Line trains will terminate at London Blackfriars from 2018. 4. Terminating Wimbledon Loop services at Blackfriars would result in our residents losing their cross-London service. This will penalise those of our residents who have made their residential, employment and educational location decisions on the basis of the existence of the cross-London Thameslink service. These residents, who chose to live in Sutton South on the basis of an existing pattern of transport connections, would lose a service that they have had for many years, and based their life around. 5. Any decision should take account of the impact of changes on the travel patterns of existing passengers, and of consequent requirements to change established travel patterns. It is because of the impact on our residents that we object to any proposal that would result in terminating Wimbledon loop trains at Blackfriars. 6. Not only would our residents lose a through service they have come to depend on, they would lose their connection with Eurostar and domestic long distance trains at St. Pancras International and Kings Cross. Instead they would have to change trains at Blackfriars, carrying possibly heavy luggage onto already crowded trains. This movement could be particularly difficult from the western bay platform when travelling north and to either bay platform when travelling south because of the platform lengths and the position of lifts and stairs at each end of the platforms. The recent Passenger Focus passenger survey found that having to change trains was a strong disincentive to train travel. 7. Sutton is identified in the London Plan as one of only four Metropolitan town centres in south London , with a large and growing population and employment base. It is a major business centre with many commuters and business travellers. It is therefore essential that Sutton, as a strategic south London destination, retains its connections to central and north London and beyond, and maintains its direct link to St. Pancras and the City. 8. We also believe that the attractiveness of Sutton to employers considering re-location away from expensive offices in central London would be affected. Sutton is a location from which one can travel to Brussels with just two train journeys, one taking 45 minutes and one two hours, and the journey to Paris is only fifteen minutes longer. We have been successful in attracting businesses to Sutton and this change would have a negative impact, particularly given the expected mushrooming of international train travel from St. Pancras over the next few years. These negative effects would impact on the residents of our Ward who want to work locally in Sutton. 9. We thus strongly object to any proposal that would result in terminating Wimbledon loop trains at Blackfriars from 2018. 10. We are aware that Sutton Council is submitting comments, and support those comments. However, we are making this submission to draw particular attention to the impact on our residents in Sutton South Ward. Congratulations on an informative campaigning website – obviously working extremely hard. Take care. Struggling with comments section of website and just found your comment from last August. Hope you are well. Life on the Council less interesting without you.